Climate Services for Resilient Development (CSRD) is a global partnership that connects climate and environmental science with data streams to generate decision support tools and training for decision-makers in developing countries. Translating complex climate information into easy to understand actionable formats to spread awareness in the form of climate services is core to CSRD’s mission. CSRD works across South Asia (with emphasis on Bangladesh), the Horn of Africa (Ethiopia), and in South America (Colombia) to generate and provide timely and useful climate information, decision tools and services. In South Asia, CSRD focusses the development, supply and adaptation of agricultural climate services to reduce vulnerability by increasing resiliency in smallholder farming systems. These goals are strategically aligned with the Global Framework for Climate Services. Climatologists and meterologists at the Bangladesh Meteorological Department cooperate with CSRD to develop improved and agriculturally relevant forecasting in Bangladesh. Photo: Elisabeth Gawthrop (IRI). The CSRD consortium in South Asia is led by the International Maize and Wheat Improvement Center (CIMMYT) in partnership with the Bangladesh Meteorological Department (BMD), Bangladesh Department of Agricultural Extension (DAE), Bangladesh Agricultural Research Council (BARC), Bangladesh Agricultural Research Institute (BARI), International Center for Integrated Mountain Development (ICIMOD), International Institute for Climate and Society (IRI), University de Passo Fundo (UPF), and the University of Rhode Island (URI). This consortium provides strength and technical expertise to develop relevant climate products that can assist farmers and other stakeholders with relevant information to improve decision making, with the ultimate goal of increasing resilience to climate-related risks. The CSRD consortium also works to assure that climate information can be conveyed in ways that are decision-relevant to farmers and other agricultural stakeholders. As a public-private partnership, CSRD is supported by the United States Agency for International Development (USAID), UK AID, the UK Met Office, the Asian Development Bank (ADB), the Inter-American Development Bank (IDB), ESRI, Google, the American Red Cross, and the Skoll Global Threats Fund. CSRD works to establish a problem-focus, to engage key stakeholders, to create a platform for sustained communication and collaboration, and to build synergies among relevant programs. CSRD provides access to useful and available information and technology, and to develop tailored products and services responsive to problem-specific needs. CSRD supports the use of targeted products and services, and to promote sustainability, scalability, and replicability. A key goal of CSRD’s work is to identify and promote good practices among the global climate services community and to support research efforts and innovation that increase the effectiveness of climate services. This activity focusses on identifying critical farm management decisions that could result in increasingly resilient agricultural productivity outcomes through the incorporation meteorological information and climate services. Examples of climactic factors that influence farm management and crop performance include the risk of encountering drought or flooding, the timing and intensity of predicted rainfall, and the probability of extreme heat, among others. These factors influence the decisions farmers make with respect to crop and livestock management, including but not limited to choose of crop species and variety, when to sow, fertilize, irrigate or harvest, in addition to key pest and disease management decisions. This activity therefore investigates the relative importance of climatic information compared to other biophysical and socioeconomic factors, and works to identify ways to communicate relevant meteorological information in support of farming communities. ​The usefulness of agricultural climate services is dependent on the precision of meteorological forecasting. This activity focusses on scientific exchanges CSRD partners in South Asia and seeks to increase the skill of climate forecasts, and to render them in easy to understand formats for farmers and other agricultural decision makers. This activity also works to develop appropriate training and technical materials on climate services for extension services and farmers. The Program for Advanced Numerical Irrigation (PANI) is a mobile smartphone app developed by CIMMYT that provides farmers and water pump owners with irrigation recommendations one week ahead of time. The goal of PANI is to make more efficient use of scarce water and energy resources, while reducing irrigation costs for farmers. Under CSRD, we are working to upgrade PANI to make use of improved forecasts to give field-specific recommendations. CSRD is also working to develop a broader irrigation advisory system, called ∂PANI, that provides users with a relative irrigation recommendation. ∂PANI compares the current weather year to a baseline established with data from the prior three years. ∂PANI also takes into account weather forecasts from national meteorological services and generates weekly recommendations as to whether crops need to be irrigated more or less frequently (∂ days) than usual. Though it is the second most important crop globally, sustained wheat production in the tropics and sub-tropics is increasingly challenged both increasing temperatures and crop diseases. Wheat blast, caused by the fungus Magnaporthe oryzae pathotype Triticum, is a crucial concern. First discovered in Brazil in 1985, wheat blast since has spread to Bolivia, Paraguay, and Argentina. In 2016, it suddenly appeared outside South America in Bangladesh, and again in 2017 with news reports of further spread to India. Late-season fungicides are only partly reliable. Seven million hectares are at risk of reoccurring infection in South Asia, with losses to smallholders of up to 1.77 MT worth $264 million year–1 with light infections of just 10%. This work stream responds requests made by Bangladesh’s Ministry of Agriculture to develop an early warning system for wheat blast outbreaks. CSRD has therefore partnered with Brazil’s Universidad de Passo Fundo (UPF) to adapt an existing wheat blast forecasting model to South Asian climatic conditions, and to train extension services in its use. This activity also provides the basis for advanced regional modeling of wheat blast risks using climatologies and climate change models combined with scenario analysis. These activities will result in both decision support tools and advisories to assist in in rational and integrated disease management in South Asia. The USAID supported SERVIR-Hindu Kush Himalaya (HKH) program of ICIMOD aims to increase use of earth observation information and geospatial technologies for environmental management, and to improve resilience to climate change. Through this program, which is aligned with CSRD, a regional effort is ongoing to establish new drought monitoring and early warning systems within by incorporating suitable earth observation datasets and linking them with local cropping systems and meteorological data. The decision support products developed through ICIMOD-HKH-CSRD collaboration will be utilized by both national meteorological agencies and institutions involved in Bangladesh, Nepal, and Afghanistan to provide farmers and agricultural planners advanced information and advisories to overcome drought. Lentil Stemphylium blight is a fungal disease threatening the sustainable production of lentil in South Asia. This activity builds on efforts conducted in Bangladesh to develop a preliminary weather-based model to predict Stemphylium, called ‘Stempedia’. Through CSRD, the model is being validated, adapted, and refined in Bangladesh, India, and in Nepal, where lentil is a key income-generating and nutritional crop for smallholder farmers. Work is also underway to incorporate extended range forecasts into the model, to develop a robust early warning system that can be used to more effectively advise farmers when and where Stemphylium outbreaks may occur. CSRD focusses not only on the development, testing, refinement, and implementation of climate services. The project also endeavors to create awareness of the importance of climate services among the public. Trainings, media events, and round-table discussions for relevant stakeholder organizations, including government, civil society groups, and NGOs, are a key part of our work in South Asia. A strengthened enabling environment for the generation, uptake, and use of weather and climate services to support resilient agricultural development. 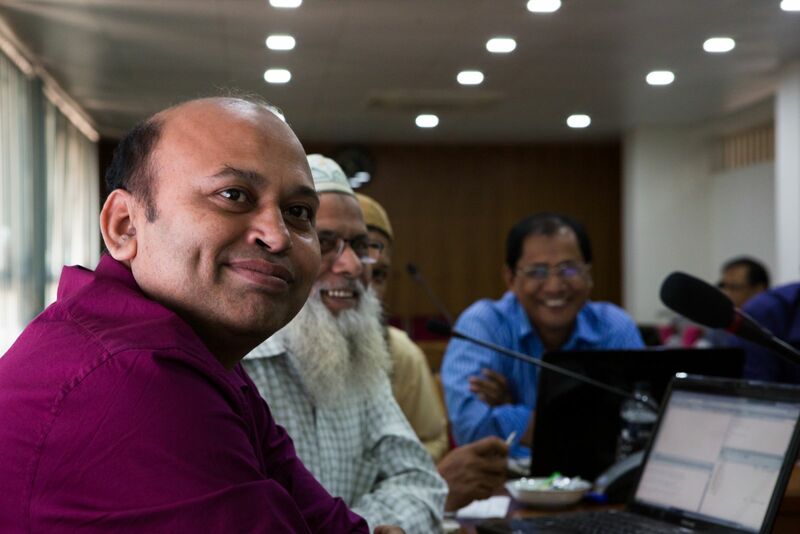 National and sub-national strategies for climate services in Bangladesh supported by more effective, user-focused decision support and communications strengthened systems. Improved data and infrastructure and communications capacity to support long-term improvements to the generation of agricultural climate services. Improved knowledge, products and services strengthened by global collaboration and interdisciplinary research. Download the report summarizing CSRD activities, achievements, and challenges during the first year (from November 2016 through December 2017). Each of the work streams in CSRD focus on providing actionable climate information to smallholder farmers and other stakeholders in agricultural systems. In order to meet this goal, CSRD in South Asia has undertaken research to better understand farmers’ decision-making processes, and preferences and priorities for climate information and crop and livestock management. Both qualitative focus group and quantitative survey methods are being used to collect data. Within these efforts, explicit emphasis is placed on understanding the gendered preferences of farmers for climate and agricultural information, and to better understand the ways in which this information can be used inform men’s and women’s decision making. In addition, CSRD works to ‘translate’ highly technical climate and weather information so it can be easily used by farming communities. We therefore emphasize pre-testing and adapting meteorological bulletins, mobile phone apps, radio messages, and other mass media to reach farmers. This is accomplished through a reflective process of evaluation by key informants and gender-representative meteorological- and climate-product focus groups.